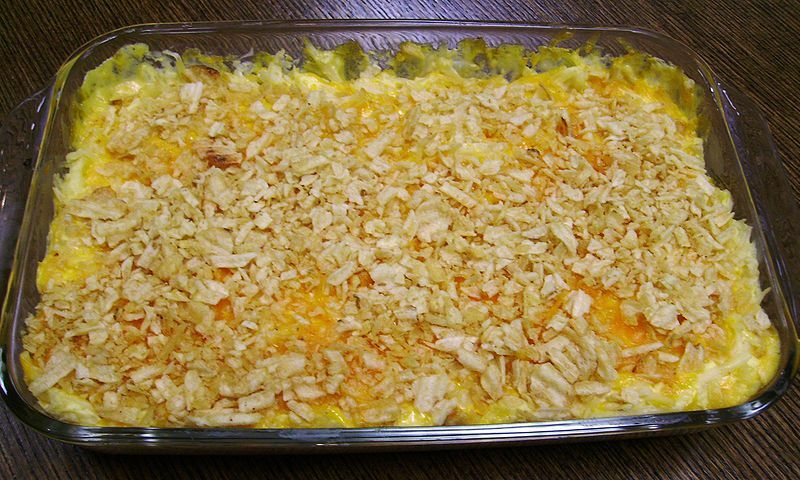 Funeral potatoes are a traditional Latter-Day Saint (Mormon) casserole dish that originated in Utah, United States. Left: A casserole of funeral potatoes. The dish usually consists of hash browns or cubed potatoes, cheese (cheddar or parmesan), onions, cream soup (chicken, mushroom, or celery), sour cream, and topped with butter and corn flakes or crushed potato chips. Other variations included cubed baked ham. Funeral potatoes get their name from commonly being served as a side dish during traditional after-funeral dinners. They are also often served at social gatherings, such as potlucks, in Utah and other areas with a large Latter-Day Saint population.